As men live longer, more face the challenge of difficult-to-control high blood pressure. High blood pressure, or hypertension, remains a common health issue for a majority of older men. In fact, approximately 54% to 67% of men ages 65 and older suffer from the condition, which occurs when your systolic pressure (the top number on a blood pressure reading) is 140 mm Hg or higher, and your diastolic pressure (the bottom number) is 90 mm Hg or higher, according to the American Heart Association. Common drug treatments include calcium channel blockers, ACE inhibitors, and diuretics, given either individually or in combination. Calcium channel blockers and ACE inhibitors help blood vessels relax, and diuretics get rid of excess sodium and water in the body. These drugs often bring high blood pressure down into a safer zone. However, some men do not respond to the therapy. If your blood pressure remains at 140/90 mm Hg despite taking the highest dosage of at least three different blood pressure medications, including a diuretic, you have what's called resistant hypertension. With such a narrow definition, resistant hypertension may not sound like a major issue, but over a 30-year span from 1988 to 2008, the prevalence of resistant hypertension in the United States has risen from 8.8% to 20.7%. "Blood pressure goes up with age. In older people, it is also common for systolic blood pressure to be elevated while diastolic pressure stays normal," says Dr. Naomi D.L. Fisher, director of the Hypertension Service at Harvard-affiliated Brigham and Women's Hospital. "But it's dangerous to wait until yours gets too high before taking action. With resistant hypertension, it may take longer to get it under control, which keeps you at a greater risk for a heart attack or stroke." When is high blood pressure not resistant hypertension? Poor measurements. There is a chance your blood pressure is improving, but a problem like a loose cuff could cause a faulty reading. Get multiple readings, at different times of the day. Not taking your medication. A 2014 study in BMJ found that one in four patients with hypertension either didn't take their medication or took it only part of the time. People may skip doses because they forget, they're fearful of possible side effects, or the pills are too expensive. Speak with your doctor if you're having trouble taking your medication as prescribed. White-coat syndrome. Anxiety at the doctor's office can make blood pressure temporarily spike, which leads to a false reading. Ask the nurse or medical assistant who takes your initial blood pressure to repeat it after a few minutes to see if it has gone down. You also can help ease anxiety by bringing a friend or family member to your appointment. When you are diagnosed with high blood pressure, your doctor will likely prescribe a blood pressure drug. It usually takes about two weeks for the drug to take full effect, and your doctor will want your blood pressure checked again within a month after your diagnosis. "He or she will have a good sense then if your medication is working, or whether the dosage should be increased or another drug added or swapped in," says Dr. Fisher. "The goal is to find the right amount and combination that works for you." How many drugs you eventually take depends on factors like your blood pressure reading (a systolic number like 150 to 160 mm Hg or higher will often require two or more drugs), your age, and whether you are overweight or sedentary. Yet drugs are just one part of treatment. Your doctor will also prescribe lifestyle modifications as needed, such as losing weight, quitting smoking, reducing salt in your diet, and being more active, all of which can help lower blood pressure. 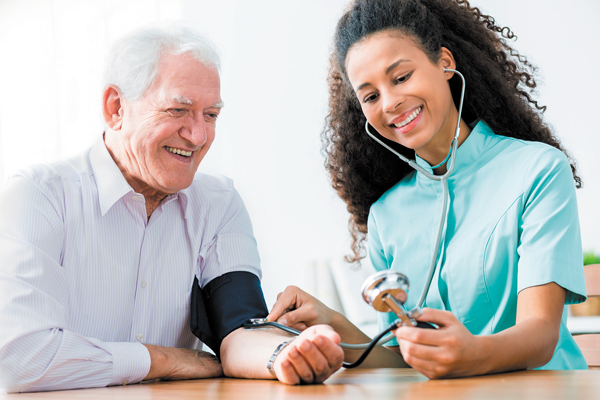 "But since lifestyle changes can take longer to implement and yield results in terms of blood pressure reduction, it's always best to prescribe medication without waiting too long," says Dr. Fisher. Sleep apnea. This common condition is marked by repeated pauses in your breathing—lasting from a few seconds to a minute or so—while you sleep. A 2014 study in the Journal of Clinical Sleep Medicine involving almost 300 people who had sleep apnea or were at high risk for heart disease found that sleep apnea quadrupled the odds of having resistant hypertension. Nonsteroidal anti-inflammatory drugs (NSAIDs). These include over-the-counter pain relievers like ibuprofen (Advil, Motrin) and naproxen (Aleve). A 2012 study in BMC Cardiovascular Disorders of 1,340 users of NSAIDs and 1,340 users of the non-NSAID painkiller acetaminophen (Tylenol) found that NSAID users had a 2 mm Hg increase in systolic blood pressure compared with acetaminophen users. "If you are taking more than occasional doses to control pain, you should discuss this with your doctor," says Dr. Fisher. Alcohol. Excess drinking can elevate blood pressure, Men should limit their intake to no more than two drinks per day, says Dr. Fisher. If you haven't responded to three standard blood pressure drugs, your doctor might try a less common choice, such as spironolactone (Aldactone) or eplerenone (Inspra). A 2017 study from the European Society of Cardiology compared various treatments in 314 people with resistant hypertension and found that spironolactone, a diuretic, was more effective than traditional choices for drug therapy. The downside is possible side effects, especially for men, like gynecomastia (enlarged breast tissue) and a rise in potassium, especially for people with kidney disease. A small study involving 57 people with resistant hypertension published online June 13, 2016, by The Journal of Clinical Hypertension discovered that adding eplerenone to the standard three-drug treatment for 12 weeks lowered systolic blood pressure by almost eight points and diastolic blood pressure by more than four points compared with a control group. The Harvard Special Health Report, A Guide to Men's Health Fifty and Forward, offers steps and strategies to lessen — or prevent — threats to a man's well-being and longevity. Buy your copy today.